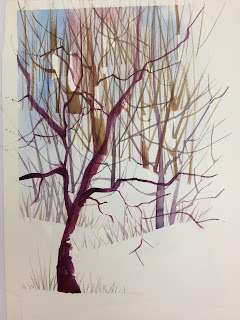 I've been meaning to post about the 3-day watercolor class I took from artist, Carl Purcell. To sum it up, it was amazing. I've been using watercolors in my illustrations for about 10 years now. I had a basic watercolor class in college but nothing since. The rest has been self-taught. It was wonderful to learn from such a talent artist AND teacher as Carl Purcell. Many artists can paint well, but few can teach well also. I learned more in those 3 days of class than in the past 10 years and my college watercolor class combined. I wish I had more time to learn from him. Someday I hope to be able to take his 2 week course. Overstroke and watch it croak- be deliberate and smart with your strokes. Do it and leave it. When Carl goes back to the pallet for more paint, he always adds another color. Let the colors co-mingle on the paper and never get the EXACT same color again. There ARE patterns in nature but an INFINITE variety within those patterns. No two things are exactly alike in nature. 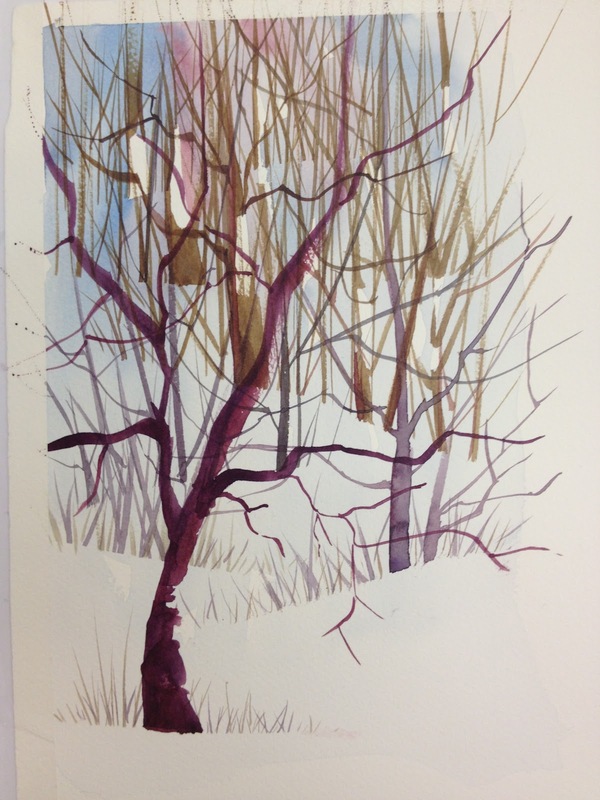 When painting trees- really look at the overall shape. Don't let the left brain take over and make it an oval or triangle. Paint the shape. Carl Laying in a background wash. Learning how to do this is essential to watercolor...he's a master at it. Once that is dry, you choose the focal point of your painting and put in your darkest darks. Then work out from there. Don't let anything outside the focal point get darker or have more contrast. He's so good at keeping it loose. He calls this the stage where it's almost done. All he did from there was add a few light foreground elements, some more trees off to the side, a hint at the grasses, some detail on the barn roof and some branches (which looks easy but is really hard). Carl is really good at taking the essence of something and redesigning it to be more beautiful. Here's the original photo. Here's what he painted instead. Still recognizable as THIS barn, but so much better designed. An exercise Carl had us do in class. Mine turned out very graphic in quality but it was fun. We laid down a wash leaving some white spaces (he said ALWAYS leave more white spaces...those disappear quickly in watercolor). Then used a paper scrap and created the illusion of snow drifts. some value studies of some of his photos he provided to practice from. the result of my first landscape try. I brought a photo of Arch Rock in Valley of Fire, NV. I almost threw it out after the wash stage. It was so ugly. But Carl told me that's the UGLY STAGE and I should keep going. So I did. I was soooo pleased with the result. I'm not as good at trees etc as rocks I think. Maybe I am just "hard edged." I don't know. But here's an attempt at a landscape with trees and water from a photo I brought. I was lucky enough to become acquainted with illustrator, artist, animator, Jake Parker, about 6 months ago through a mutual friend (also an illustrator). I was instantly impressed with his resume, his art and his overall kindness and creativity. His family is beautiful and friendly, especially his wife who goes out of her way to make people feel welcome in their home. They both are great supporters of education, the arts and community. 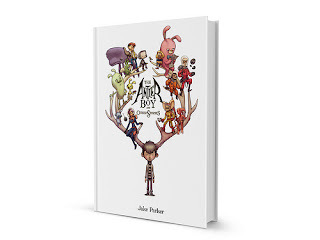 Here's a little interview so you too can get to know Jake Parker and his art. Enjoy! 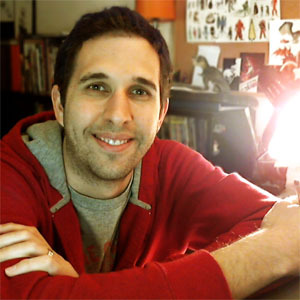 Jake, you seem to have done it all...animation, teaching, comics, picture books. I know everyone's story is different and there's no one right way to make it as an artist. Can you give us a brief rundown of your personal path to success? It all started when I decided to try out for a position at Fox animation studios in Phoenix during my freshman year in college. They needed assistants to help with animation and something in my humble portfolio told them to take a chance on me. So I left school and have been working ever since. That job opened doors to other jobs which opened more doors to others. You currently have 5 kids, work full time as an artist for a educational software company, illustrate picture books and more. How do you juggle it all? I work a lot of nights and weekends and I probably say yes to too much. My wife is amazing and does a great job holding down the fort. I don't watch TV or play video games or have any hobbies. I just put everything into art and family. I do take Sundays off and that's pretty good for charging my batteries for the week. As I mentioned, you do it all...do you have a favorite genre to work in? Comics, Picture books, Animation? I like each for different reasons. They all work different creative sides for me. But I always come back to comics. Your newest venture is a Kickstarter project called THE ANTLER BOY AND OTHER STORIES, which is a collection of 9 stories from graphic novels and comics you've created that are mostly out of print, right? (For those who don't know, Kickstarter is the worlds largest funding platform for creative projects...check it out...it's pretty amazing). Tell us about what prompted you to take this route, what the challenges have been, and what advice you have for anyone looking to start a Kickstarter project. After talking with my agent about this book idea to collect all my previously published stories we decided with how the publishing landscape looked right now the niche for a book like this was too small for a publisher to be interested in it. So I came up with a plan to self publish and fund it through Kickstarter. The challenge with running a successful Kickstarter campaign is it ends up taking a lot more time than you plan. I've been getting a lot less sleep these past few weeks. Also, I'm new to this, so there's been a learning curve. But I've found that if your honest, professional, have a quality product, and present well it makes up for what you don't know. My advice to those out there planning their campaigns is to look at like it's an actual presidential campaign. You have to present yourself and your platform well, you have to have inciting incentives and promises, and you have to sell yourself as someone who delivers. The key to that is somehow making a connection with each person. It might be through your art or music, it might be how you run your campaign, it might be through your killer video. You don't vote for someone you haven't connected with and you don't back a Kickstarter that doesn't connect to you somehow. I'm amazed at the volume of wonderful art you produce. I'm sure your training in animation (along with your raw talent) taught you to draw often, profusely, and well. Thanks so much for taking the time to share a little about yourself today with us. So I'm a couple days late with this and I apologize. The month May came upon me far too fast. At least I got this posted before it was really too late. 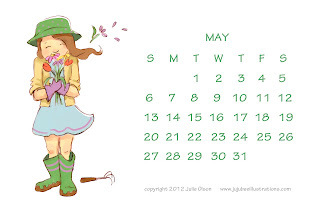 Enjoy this month's printable calendar. Or you can set it as a desktop background image if you'd like. Just download and print on a 4x6 sheet of printer photopaper and wahlah! 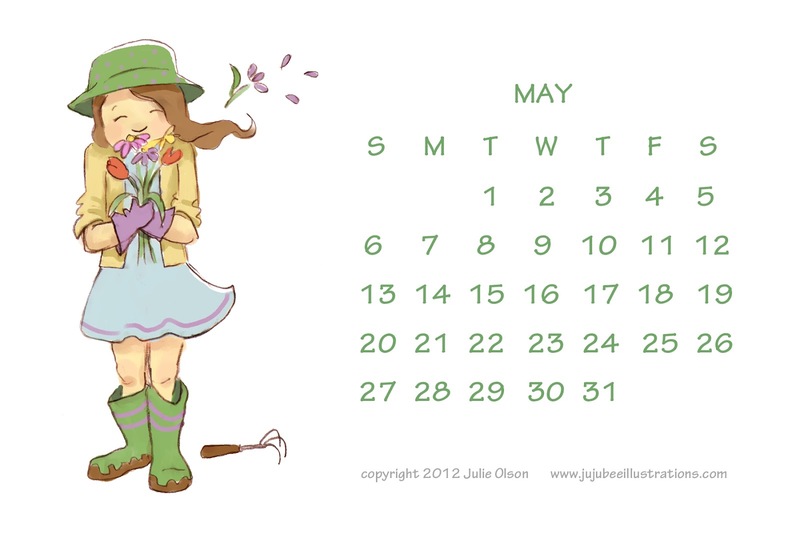 You've got a cute calendar to hang on your fridge, pin to the wall of your cubicle or place in a 4x6 photo frame. I hope you enjoy! Only for personal or schoolroom use. Do not republish or reprint for sale anywhere. Thank you! You can see other ways to use this calendar HERE.